A spring 13 May 1950, when Elvis Presley made his first "dabbled" with the guitar, and the music of Frank Sinatra, Miles Davis, Mahalia Jackson and Ray Charles played on the radio, I was going to happen one of these events were to be momentous for music in the coming decades. It was the premature birth in a small town in central northeastern United States of just 92,000 people called Saginaw (Michigan), the third son of Lula Mae Hardaway in a family surfing in poverty and disgrace. That little creature -named Stevland Hardaway Judkins- was blind by excess oxygen in the incubator where they helped to give their first breaths of life. 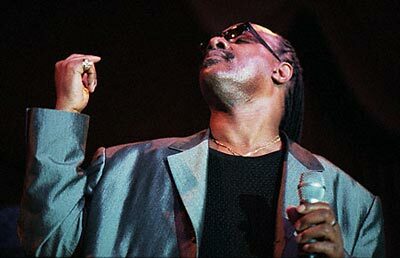 His future is bleak and complex venture, but the spiritual strength and inner star only a few have inside, made the "ugly duckling" moved his dark future and become a spectacular "swan" has shone and shines brightly to date, reaching the name known to all of Stevie Wonder. Few are the people who have attained the status of genius by nature and creativity in music. His today could not exist without a past where music has reached a breakthrough with him a advance logarithmic in her evolution. And his future could not exist without observing a today lively and full of excitement with his presence in the music. In his biography is related how while he remained in a coma after a traffic accident, he only responded by moving his fingers when his manager sang in his ear the lyrics of this song. He said that "I would like to believe in reincarnation, to believe that there is another life. I wrote Higher Ground even before the accident. This is like my second chance to do something or do more, and appreciate the fact that I am alive." He is unique and unrepeatable. He has managed to climb to the top of the musical universe, so to the strains of one of his genius shaped of song, I congratulate him and thank him for giving emotions, love, and a doctrine to life positive and tolerant. Happy Birthday Stevie, you are already at the top. You are at the Higher Ground, but especially in the deepest and within of our hearts.